Dr. Aimee Cribbs has twenty years of elementary classroom experience in Georgia's Title I schools. She's taught in a diverse, urban setting and a small rural system. She currently serves as an Education adjunct for Piedmont College and the Morningside College Applied Research Center. She is also a teacher candidate supervisor for Dalton State College. Her research focuses include teaching creativity, educators as the instruments of reform, and graduate writing self-efficacy. She is an advocate for teachers, who she believes have the single most important job in the world. Do you happen to have 63 pipe cleaners (aka chenille sticks)? Or a bottle of ketchup? You never know what you may find yourself needing as a new teacher. We are masters of thinking on the fly, especially when it comes to putting together a bang-up lesson, which means a lot of unexpected supplies. 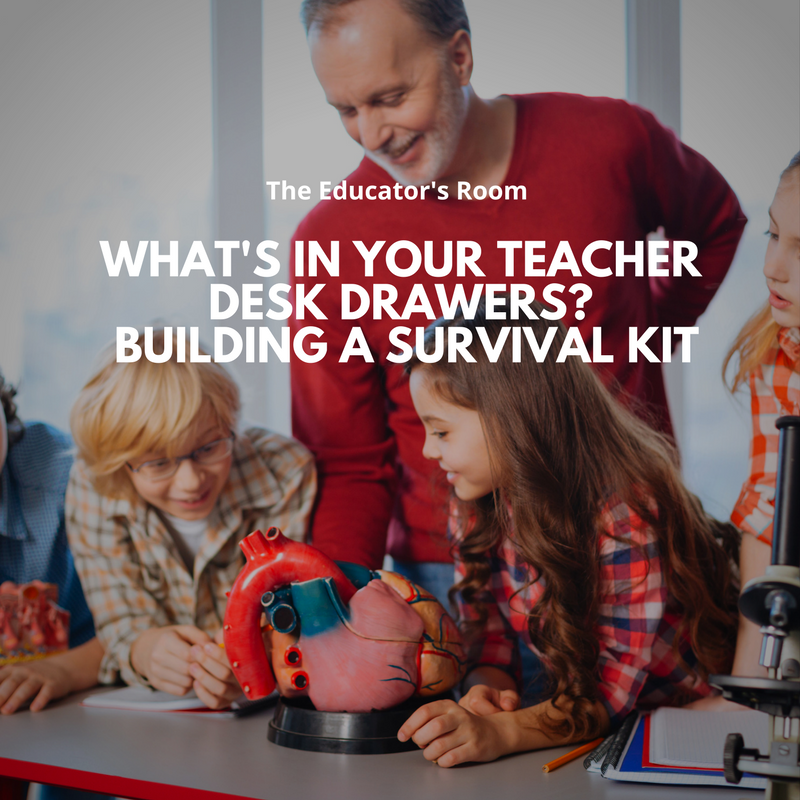 As a beginning teacher, you have too much on your mind to worry about the supplies in your desk drawers. This list of unexpected things every new teacher should have on hand was assembled by veteran teachers at The Educators Room. You may even end up chalking up a few brownie points when you are the teacher on the hall who thought of everything. Tool Kit You’ll need a screwdriver with removable bits and maybe a set of Allen wrenches to change desk height. Ikea has a self-contained tool kit that’s perfect. Double-sided tape Shhhh… don’t tell…but nothing else seems to stick to cinder block walls. Toothbrush, deodorant and dental floss These are a nice way to refresh when you have a parent conference or meeting after a long day at work and you can’t make it back home. Change of clothes and Stain-remover:You may also want to keep outdoor gear such as a rain jacket and hat and gloves handy for recess, bus dismissal or outdoor duty. It also doesn’t hurt to be prepared for unexpected accidents with a full change of clothes. Needle and thread and safety pins: For missing buttons and other wardrobe malfunctions that may occur throughout the school day. Magic erasers: They are probably radioactive since they can clean so much, but they really are magic. They do a wonderful job on white boards and have even proven to remove Sharpie from a computer monitor screen. Brown, multi-folded paper towels: Nothing seems to comfort a child like a wet brown paper towel. A white one doesn’t do the trick and the ones on the rolls are just not the same. You can find these on Amazon. When a student complains of a headache or itch, save a trip to the nurse. Nail polish remover: Yes, even if you are not of the nail polish-wearing variety, you need a bottle. It removes everything from desks and table tops. Sanitary Supplies Depending on the age of your students, having a supply on hand might save your female students some embarrassment. Quick foods: For yourself and hungry students, things like granola bars, animal crackers, and fresh fruit beat a trip to the expensive snack machine. Change: Then again, we are human, so there are moments when nothing will do but a soda or candy bar. Don’t be caught off guard! Hairspray and ponytail holders : Who knew you could get your MacGyver on with hairspray? It removes glue residue, preserves leaves, flowers and chalk drawings and it’s great for removing lint. Ponytail holders are a lot more durable than their rubber band cousins. Flip flops You never know when you’ll need to pretend that you’re at the beach. A folder of funnies Keep your favorite notes from students, parents, and colleagues in your top drawer for the moments you need reassurance and direction. You should also have a way to access something that makes you smile quickly…like favorite photos or funny memes. Chocolate and Excedrin These are for you. Chocolate seemed to be the one universal from all veteran teachers. You choose what small pick-me-up is perfect to have on hand. We all know that nothing is worse than teaching with a headache, so be prepared. If you’re not able to find each of these in time for the first day of school, don’t sweat it. While it never hurts to be prepared, any veteran teacher will tell you that it’s more important not to sweat the small stuff. Find confidence in a career that encourages individuality, find a colleague with a supportive ear and learn how to put on your flip flops and laugh about the challenging moments.